I’ve been a big fan of Lush for more years than I can remember, and although I love all their products, my absolute favourites are their autumn and winter range. 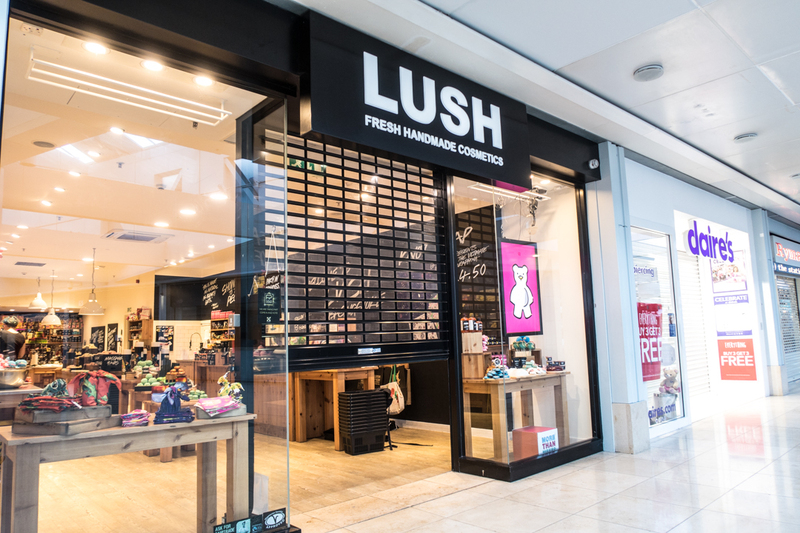 Recently, I organised a South East Bloggers Circle event with Lush Basingstoke, and the lovely ladies in the store talked us through their new products. There are so many awesome items this season, so I’ve decided to split them into two separate blog posts. In this post I will introduce you to some of the general autumn and Halloween range, then I’ll pop another post up soon, which will contain their Christmas collection. I must admit I’m not big on Halloween. It’s not something I’ve ever celebrated growing up and I’ve always been a bit confused about where I should stand as a Christian. However, I have started to enjoy carving cute pictures on pumpkins, finding fun little decorations and candles, and just celebrating autumn in general. Lush have some adorable products this year to help ease us into the autumn months and I found it very difficult to not buy one of everything! The first item that caught my eye as we entered the store was this cute little ghost. Boo is a bath melt, containing calming mimosa, grounding sandalwood, vivid Sicilian mandarin oil and earthy, warming ginger. You simply pop him under warm running water and the Fair Trade, organic cocoa butter will melt away, leaving your skin softer. I absolutely adore bath melts, as they leave my skin feeling so nourished and silky smooth. He retails at £3.50. Next to Boo was the Green Bubbleroon, which isn’t actually an autumn product but I thought the colour was rather ghoulish! 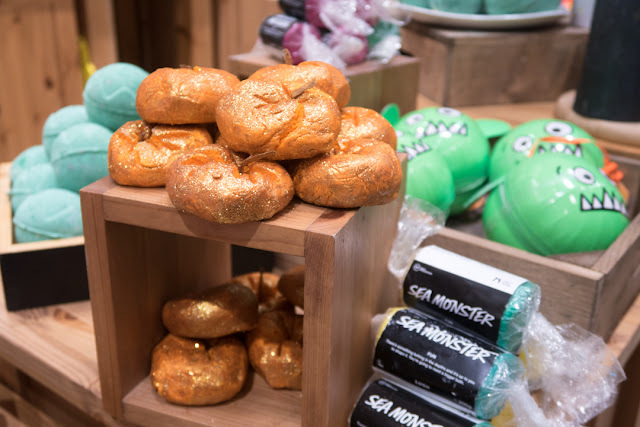 This is a moisturising, citrus-scented bubble bar with bergamot to brighten your mood, fresh avocado to reinvigorate and shea butter to make your skin feel like velvet. Bubbleroons aren’t quite as bubbly as other bars, but do contain extra-softening ingredients to hydrate your skin. They retail at £3.95. Next up, and probably one of my favourite autumn products, is the Sparkly Pumpkin Bubble Bar. It contains juniperberry oil, which is balancing for your hair and skin, lime oil to uplift and protect you, and grapefruit oil, which is uplifting and refreshing. As well as these gorgeous scents, you’ve also got lots of gold glitter, to really make your bath a special experience. The Sparkly Pumpkin retails at £3.95. The Lord of Misrule bath bomb is a cult Lush autumn product, but one I’ve never actually got round to trying before. It features a spicy herbal blend of patchouli and black pepper oil, which is both warming and clarifying. 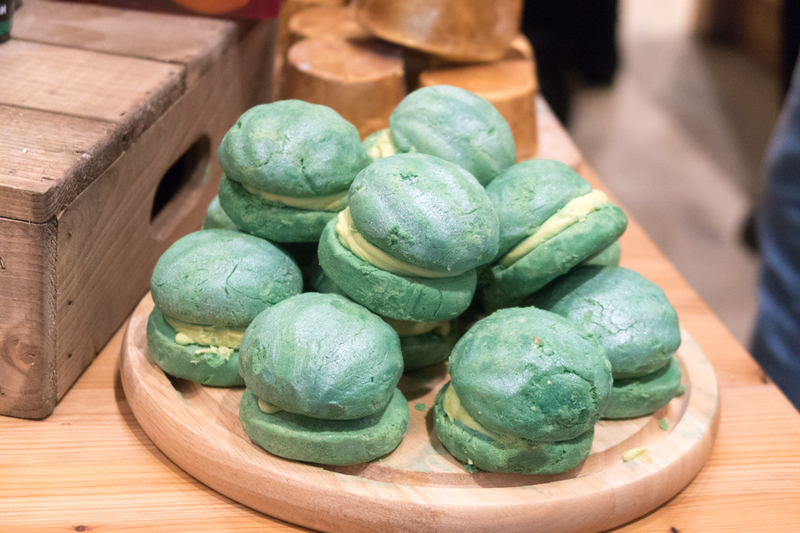 The bath bomb is inspired by the ruler of the pagan Feast of Fools, with a deep green exterior that slowly froths away to reveal a rich, wine-coloured centre. You will also get a popping surprise as it bubbles away! Lord of Misrule retails at £3.95. 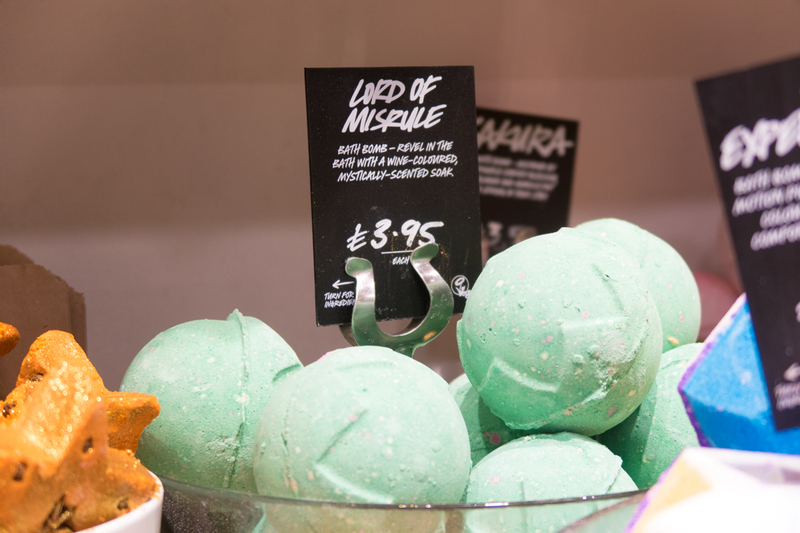 A great product to complement this bath bomb is the Lord of Misrule Shower Cream. Like the bath bomb, you get a herbal blend of patchouli, peppercorn and black pepper with an intriguing vanilla sweetness. Organic wheatgerm oil provides a rich and creamy feel on the body, to make sure you are party ready over the festive season. This comes in a range of sizes from £4.95 for 100g to £27.95 for a massive 1kg! Another product that isn’t technically an autumn product (but that looks very festive!) is Sunnyside Bubble Bar. 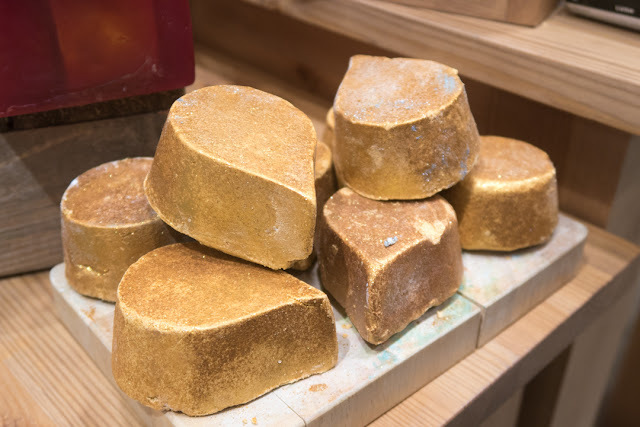 You can bathe in a bath of liquid gold with this mood-enhancing bar of indulgence. With a blend of sweet wild orange, lemon and tangerine oils to perk you up and tone your skin, you will feel bright a cheerful after taking a dip with Sunnyside. It retails for £4.95. There were a few more products that I didn’t manage to get a photo of, but I was desperate to show you them, so I’ve used the photos from the Lush website in the collage above. Fireside Soap is a really beautiful addition, with an orange and yellow flame flickering through the centre of the soap. It carries a spice of clove bud with the sweetness of vanilla. Monsters Ball bath bomb is the cutest little monster I’ve seen! It reminds me of a character from Monsters Inc. and contains a mash-up of uplifting lime and neroli oils to get you feeling ready to do the monster-mash all night long. 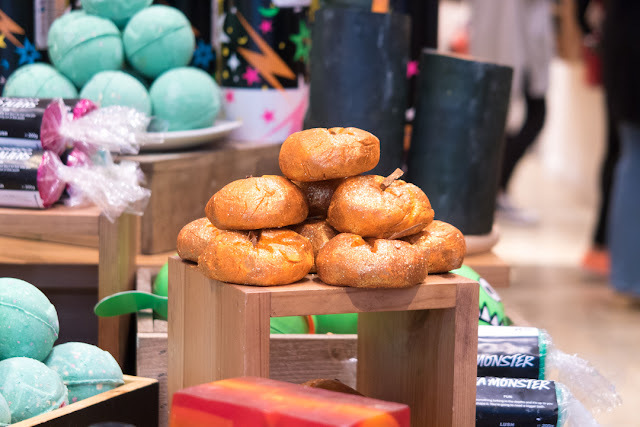 You can’t have Halloween without Pumpkin and this sweet and comforting bath bomb contains vanilla absolute and spicy cinnamon, evoking the rich, biscuit fragrance of home baking. If you’re looking for something a little different, then look no further than Goth Fairy the shimmer bar. She contains a mixture of iridescent lustres – gold, green, purple and silver, which adorn your skin in shimmer from the first stroke. Illipe and cupuaçu butters will gently melt, softening your skin and leaving a gorgeous fruity scent of almond, grapefruit and bergamot. Another of my favourite products (which I haven’t even seen in person, so it must be good!) is the Autumn Leaf bath bomb, with beautiful autumn colours that dapple your bath red and yellow. With a scent of fresh grass evoking memories of crisp leaves, you will really feel like you are being transported into an autumn country walk. 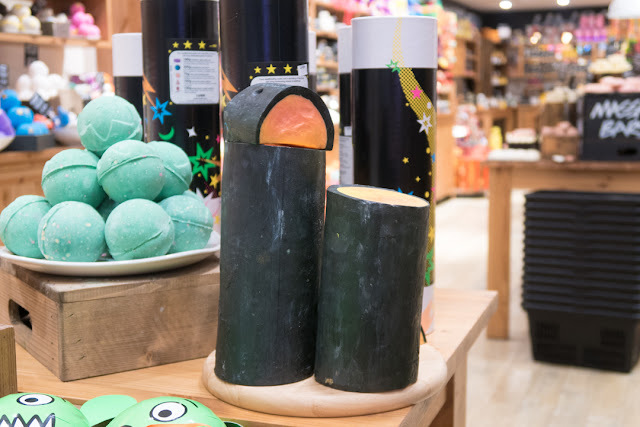 If it's gifts you're after, the Pumpkin Gift contains a few Lush products including Sparkly Pumpkin and Boo. But if you’d prefer to put together your own gift, why not ‘wrap’ them in one of these spooky knot wraps? The wrap can be used afterwards as a scarf or accessory too! My favourite Halloween gift is this adorable Little Monster. How cute is he?! 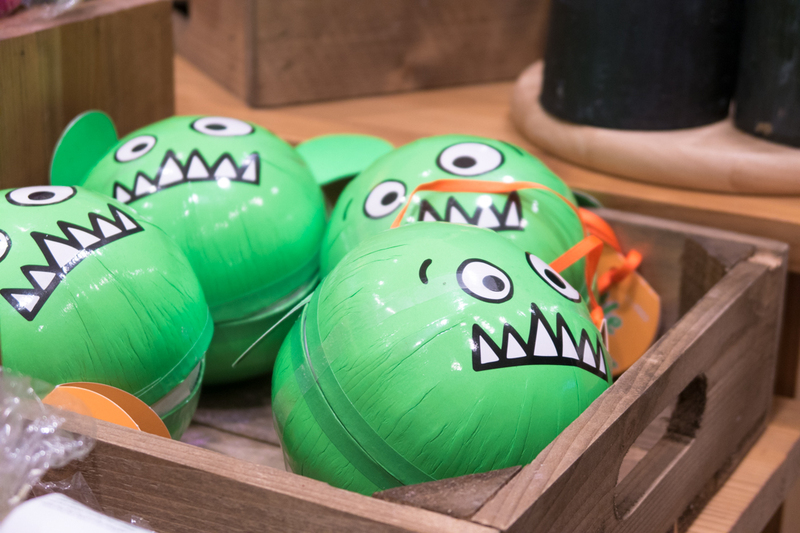 It contains two ghoulish goodies, which will get you ready to monster mash the night away! 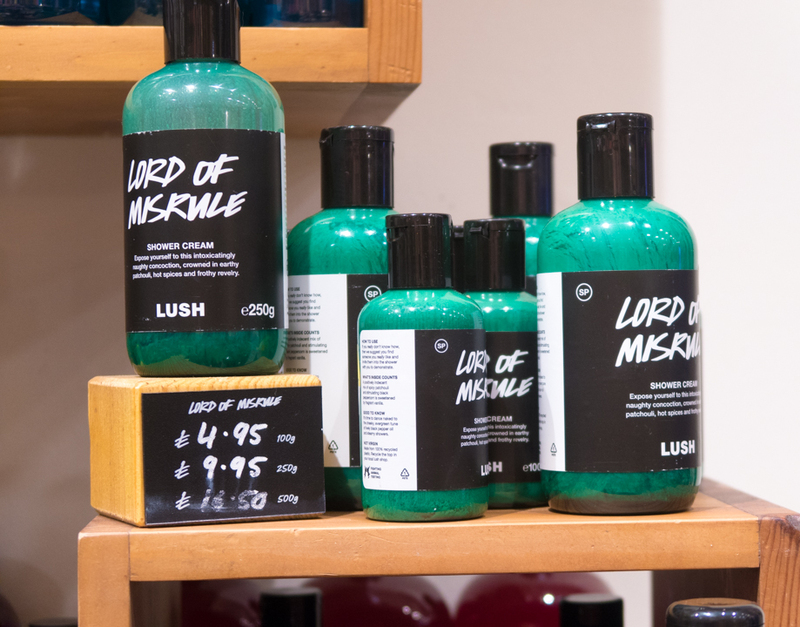 With some Lord of Misrule Shower Cream and a Monsters Ball bath bomb, you will definitely feel ready and raring to go when Halloween hits us. This gift will cost you £10.95, so perfect for treating a friend or picking up for yourself! 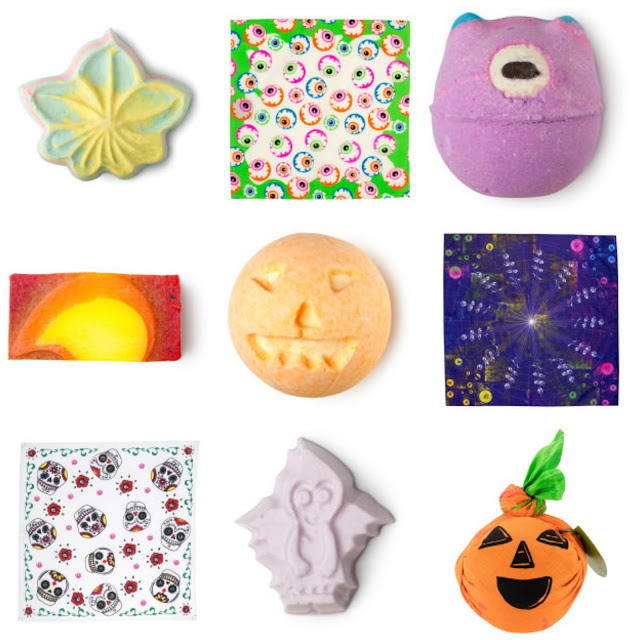 The final product I found in their Halloween range is the Magic Wand Soap. It actually comes as a huge magic wand in the store, and the staff will then cut off a piece in a size that suits you. The orange heart of the soap contains tangerine and orange oil to uplift and tone your skin. And the absorbent charcoal and extra virgin coconut oil mingle, ensuring that one light lather will magic your skin squeaky clean. Plus all traces of palm oil have magically disappeared, which is great news! For 100g you will pay £3.50. I’m really impressed with this year’s Halloween collection, and am so excited to share their Christmas products with you soon! I have also filmed a vlog of the event, so keep an eye on my YouTube channel for when that goes up. I hope this has helped to give you a quick introduction to the range. I’d love to hear which products you’ve picked up from Lush recently. 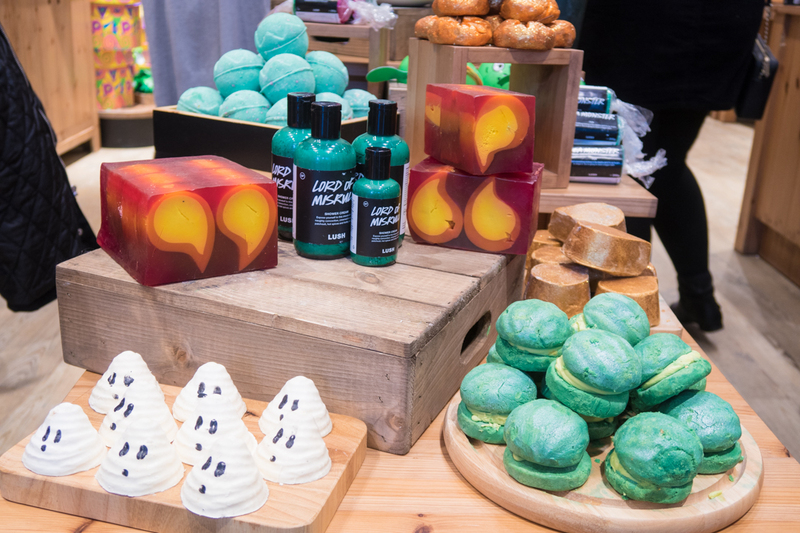 Are you a fan of the Lush autumn and Christmas range? 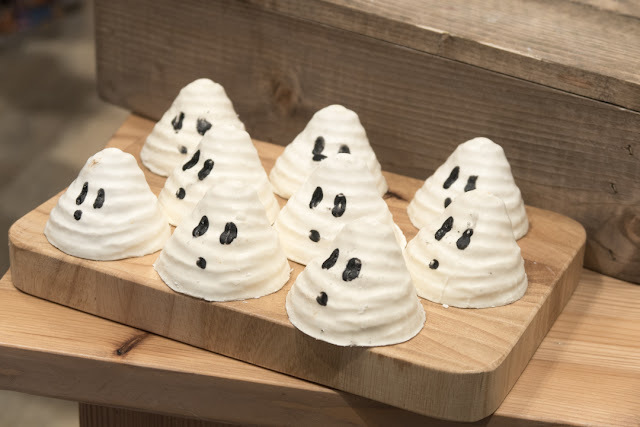 Which is your favourite Halloween product? I really love the Monsters ball. I was very disappointed with the boo bath melt as I've used 2 now, and neither left my skin feeling slightly moisturized.